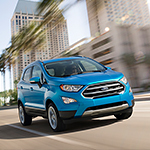 Style Features of the Ford EcoSport | Cortese Ford Lincoln Inc. If you have not seen the compact crossover Ford EcoSport yet, you may be surprised at all of its style features. One of the top features is the power moon roof. The moon roof opens and closes, allowing you to enjoy the sunlight or moonlight or block it whenever you want. The Ford EcoSport also boasts a unique rear gate. Instead of lifting up, it opens outward like a door. This makes it easier to get people, pets and bulky items in and out of the vehicle. With your key fob, you can unlock the gate and the doors. Are you excited about these style features? Come visit our showroom at Cortese Ford Lincoln Inc. to see the Ford EcoSport for yourself. We'll set you up for a test drive of this vehicle when you're ready.